Get your free Creamies at the Odgen Marathon. As you can tell from the picture, the Ogden Marathon is a fun experience. We enjoy participating in this marathon because of the diverse crowd that participates in the marathon. 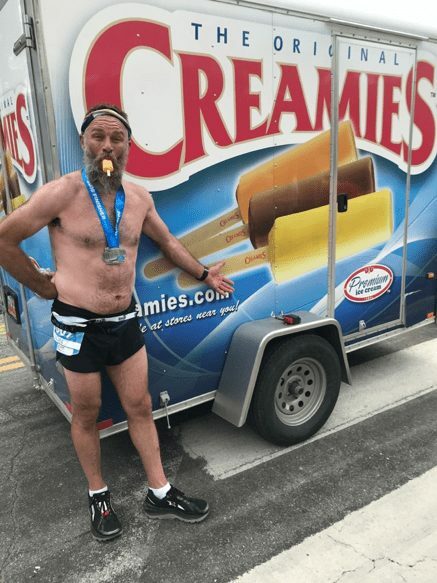 We love hearing people when they cross the finish line and say “I ran this marathon just get a free Creamie.” Creamies are that delicious. Runners love eating our healthy ice cream bars after a long, difficult run. They are made with real ingredients and make for one tasty treat to reinvigorate yourself after a long run. Typically, at marathons, we like to provide our Originals. They are the best ice cream bars you can find. Our originals include chocolate, orange, and banana. If you are ever at the Ogden Marathon please come by our tent and grab yourself and your family a free Creamie-they are delicious! To request Creamies at an event near you, please contact us through our contact page and we will get back to you ASAP.